I usually write about all kinds of recipes that take time and preparation to make but not today. Today I want to talk about easy and fast recipe ideas. Birdseye reached out to me and asked if I wanted to share I new product and I jumped at the chance because I love the brand. 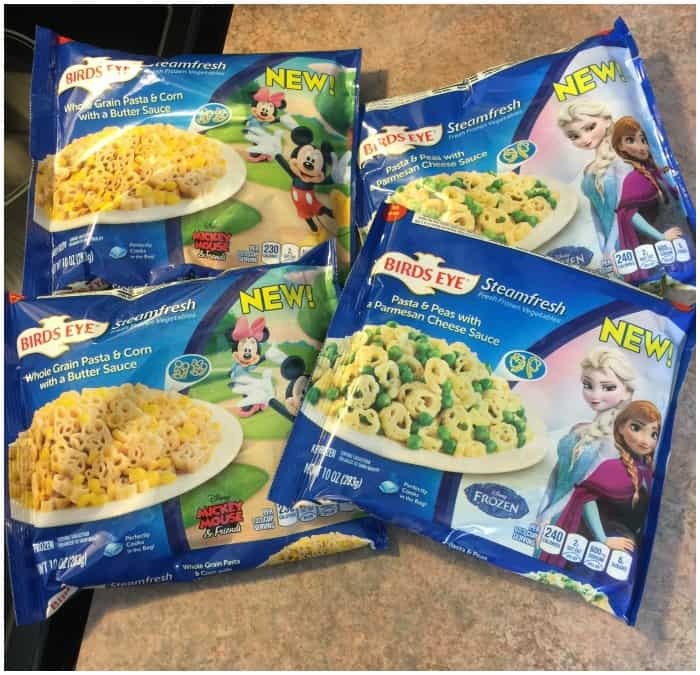 I already buy Birds Eye frozen vegetables so it just makes sense to show people how I use their vegetables. Besides, no matter how much I plan or how prepared I “think” I am there are always those days that I was simple and Birds Eye fits into my simple plan. I refuse to drive up the street to grab a 99¢ burger from the happy place. Yuck. I just won’t do it. There are much easier and smarter choices you can make for days like this. Yesterday was a crazy busy day for me. I worked all day, ran errands, dealt with after school stuff and it was already dinner time. I didn’t even take anything out for dinner this morning. Why is it always my job to think about dinner during my morning coffee? I’m not sure why but it’s my job and today I forgot. It’s days like this where we usually spend more money out of our budget going out to eat because I forgot. Not anymore. Here’s my backup plan for these types of days. I always purchase 2 to 4 bags of Birds Eye Steamfresh vegetables and one package of frozen pre-cooked chicken strips. This way I can pop them in the microwave and have dinner on the table in under 10 minutes! The Birds Eye Steamfresh vegetables typically take only 4 minutes to heat and the chicken strips take only 5 minutes to heat up! Sometimes I used leftover chicken and sometimes I heat it on the stove but on super busy days I use the microwave. I never have to worry about a sauce because the Birds Eye vegetables have the most amazing sauce in them. I’m talking delicious! So yummy that my daughter usually wants to lick the bag (after it’s cooled of course). Who does that? I used to do that with desserts but never a vegetable bag. That right there tells you just how yummy their sauces really are. Not only do they taste good but the kids go crazy for their favorite characters too. Right now there’s huge hype with Disney’s Frozen and Mickey Mouse. Look what I picked up at my local grocery store this week. I grabbed a Birds Eye Steamfresh Whole Grain Pasta & Corn with a Butter Sauce and a Birds Eye Steamfresh Pasta & Peas with a Parmesan Cheese Sauce! I love peas so that’s the one we ate first. I wished you could smell and taste this! It’s so darn good! So let me ask you, what do you do on busy days where you forgot to defrost something for dinner? Leave a comment below and give me your tips or tricks. By Jennifer on October 20, 2015 Chicken recipes, Main Dishes, Recipes.